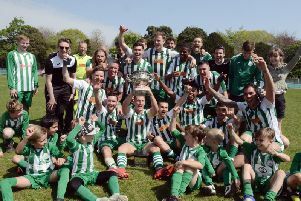 Unicorn United chairman David Phillips became the oldest player in Horsham and Worthing League history when he played 20 minutes as the Bognor pub side clinched promotion and all but won the title. The 4-3 win at BC Rovers means the Uni need just one point from their last three games to be division two champions as they chase a league and cup treble. Phillips, who is 58, went into attack when he left the bench and nearly capped his debut with a goal after unselfish play by Brad Nixon. “I have been chairman of the club since it was formed in 2012 and am proud to have been associated with such a fine group of young men,’ said Phillips. “It was wonderful to pull on the shirt and play for the club for first time and I thoroughly enjoyed the experience. Who are the Sussex football hotshots? Nixon scored twice and there were goals for Tyler Hope and Sam Clarke a week after Unicorn reached the semi-final of the League Cup with a 7-2 win over Angmering. Sam Garnett scored an own goal in the first minute but a Joseph Matthews hat-trick, a double from Nixon and strikes from Tom Simmonds and Danny Passingham put the Unicorn in control. The unfortunate Garnett conceded a late penalty which was converted by the Angmering goalkeeper.